The aim of this study is to determine the effects of Student Teams Achievement Divisions (STAD) and Learning Together (LT) methods of cooperative learning model and the conventional methods on academic achievement and retention of the knowledge leraned in the subject of Analytic Examination of the Circle of candidates of primary school mathematics teaching. Quantitative research methods are used in and this study is designed according quasi-experimental to pre-test, post-test design with control group. The sampling of the study is formed by the 76 students in normal and evening education groups of 3rd grade in primary school mathematics teaching department at a state university. The achievement test formed by the researcher, module tests are used as data collection tools in the study. The study is held with 2 experimental and 1 control groups in tottally three classes. STAD method is used in the first group, LT is used in the second group, and the conevtional methods are used in the third group. Descripitve statistics, one way variance analyses (ANOVA) and LSD multiple comparison tests are used in the analyses of quantitative data. Consequently, it is seen that STAD and LT methods are more effective on academic achievement of the students and the retention of the knowledge. It is also seen that STAD is more effective on academic achievement and LT is more effective on retention. Akar, M. S. (2012). Informing of Science and Technology Teachers About Cooperative Learning Model, Applications of This Model in The Class and Evaluating The Obtained Results: (Kars Sample). PhD Thesis, Atatürk University, Erzurum. Akbuga, S. (2009). The Effect of Group Activities Structuredaccording to Cooperative Learning Principles on Students’level at The Beginning and at the End and Attitudes in 4th Grade Mathematics Lesson in Primary School. Unpublished Master's Thesis, Dokuz Eylul University, Izmir. Akpınar, B. and Gezer, B. (2010). Learner-Centered New Educational Paradigms and Their Reflections on The Period of Learning and Teaching. Dicle University Journal of Ziya Gökalp Faculty of Education, 14, 1-12. Aksoy, G. (2011). Effects of Reading-Writing-Application and Learning Together Methods on Students’ Understanding of Laboratory Experiments in Science and Technology Course. Master's Thesis, Atatürk University, Erzurum. Arısoy, B. (2011). The Effects of Stad and Tgt Techniques of Cooperatıve Learning on Sixth Grade Students’ Academic Achievement, Retention and Social Skill Levels in “Statistic and Probability” Subject in Mathematics Lesson. Unpublished Master's Thesis, Cukurova University, Adana. Arslan, A. and Sahin, T. Y. (2004). The Effects of Cooperative Learning Based on Constructivist Learning on Students’ Affective Learning. XIII. National Educational Sciences Congress, Inonu University, Malatya. Avsar, Z. and Alkıs, S. (2007), The effect of cooperative learning “Jigsaw I” technique on student success in social studies course. Elementary Education Online (EEO), 6(2), 197-203. Bayrakceken, S. (2008). Test Geliştirme. Edt. E. Karip. Ölçme ve Değerlendirme, 244-277, Pegem A, Ankara. Basturk, R. (2009). Deneme Modelleri., A. Tanrıöğen. (Editör).Bilimsel Araştırma Yöntemleri. Ankara. Anı Yayıncılık, Ss.31. Bilgin, T. (2004). The Usage of Student Teams and Achievement Divisions and Technical Results of Application on Seventh Grade in Elementary Mathematics Course (Regarding polygons). Uludag University Faculty of Education Journal, 17(1): 19- 28. Bilgin, I. and Geban, O. (2004). 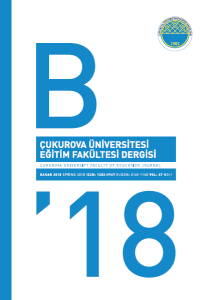 Investigating The Effects of Cooperative Learning Strategy and Gender on Re-Service Elementary Teacher Students’ Attitude Toward Science and Achievement of Science Teaching Class I, Hacettepe University Journal of Education, 26, 9-18. Bozkurt, Y. (1999). The Effects of Various Assessment Methods for Measuring for Measuring Achievement in Cooperative Learning Group at Fourth Grade Elementary Mathematics. Unpublished Master's Thesis, Hacettepe University, Ankara. Brahmer, K. and Harmatys, J. (2009), Increasing Student Effort in Complex Problem Solving Through Cooperative Learning and Self Recording Strategies. Buzludag, P.(2010). The Effects of Teaching with Cooperative Learning of Unit of Reproduction on Livings on Achievement in Science Lesson. Master's Thesis, Fırat University, Elazığ. Buyukozturk S. (2010).Sosyal Bilimler İçin Veri Analiz El Kitabı, Pegem A Akademi, Ankara. Can, A. (2014). Spss İle Bilimsel Araştırma Sürecinde Nicel Veri Analizi. Pegem Akademi Yayınları, Ankara. Calıskan, F. (2005). The Effect of Active Learning Methods of Analysis Story on Academic Success, Attitude, Level of Active Learning of Primary School Fourth Class Student in Social Study.Unpublished Master's Thesis, Mustafa Kemal University, Hatay. Cırakoglu, C. (2009). The Effects of Cooperative Learning and Traditional Learning Approaches on 6th Grade Students' Academic Achievements in Geometry Course. Master's Thesis, Gazi University, Ankara. Dellalbası, O. (2012). The Effects of Jigsaw and Group Research Techniques to Academic Succes of The Eight Grade Elementary Students. Master's Thesis, Atatürk University, Erzurum. Doymus, K., Simsek, U., &Bayrakceken, S. (2004). The Effect of Cooperative Learning Method on Attitude and Academic Achievement of Science Lessons. Journal of Turkish Science Education (TUSED), 1(2), 103-115. Duru, A. (2010). The experimental teaching in some of topics geometry. Educational Research and Review, 5(10), 584-592. Efe, M. (2011). The Effects of Cooperative Learning Method of Students? Teams- Achievement Divisions and Team Assisted Individualization Instructions on Students? Attitudes, Achievement and Motivation at Primary 7th Grade `Statistics and Probability? Units on Mathematics Course. Master's Thesis, Mustafa Kemal University, Hatay. Ergun, A. (2006). The Effects of Cooperarive Learning on Eight Grade Elementary Science Teaching. Master's Thesis, Pamukkale University, Denizli. Ertekin, B. (2001). The Effects of Traditional and Cooperative Learning Methods on the Science Teaching. Master's Thesis. Pamukkale University, Denizli. Eskiturk, M. (2009). “The Effect of Cooperative Learning Activities, Which Take the Base Critical Thinking Ability, to Academic Success in Social Science. Master's Thesis. 18 March University, Çanakkale. Frisbie, D. A. (1988). Reliability of Scores From Teacher-Made Tests. Educational Measurement: Issues And Practice,7(1), 25–35. Gelici, O. (2011). The effect of the Cooperative Learning Techniques on the Seventh Grade Students' Achievement, Attitude and Critical Thinking Skills in Mathematics Course Algebra Learning Space. Unpublished Master's Thesis, Mustafa Kemal University, Hatay. Gencosman, T. (2011). The Effects of Using the Student Teams Achievement Divisions Technique in Science and Technology Education on Students? Self-Efficacy, Test Anxiety, Academic Achievement and Retention. Master's Thesis, Akdeniz University, Antalya. Gomleksiz, M. (1997). Kubaşık Öğrenme: Temel Eğitim Dördüncü Sınıf Öğrencilerinin Matematik Başarısı ve Arkadaşlık İlişkileri Üzerine Deneysel Bir Çalışma. Adana: Baki Kitap ve Yayınevi. Gulsar, A. (2014). The Effects of Cooperatıve Learnıng on Mathematıcs Achıevement and Students’ Vıews Concernıng the Method. Master's Thesis,Uludağ university, Bursa. Hevedanlı, M., Oral, B.& Akbayın, H. (2004). The Effects of Cooperative Learning and Traditional Teaching Methods on Students’ Achievement and Retention ın Teaching Biology. XIII. National Educational Sciences Congress, Inonu University, Malatya. Johnson, D.W., Johnson, R.T., & Stanne M.B. (2000). Cooperative Learning Methods: A Meta analysis. Karaoglu, I. B. (1998). The Effects of Traditional Teaching Methods and Cooperative Learning on Student Achievement, Retention and Classroom Management. PhD Thesis, Dokuz Eylül University. Izmir. Karasar, N. (2005). Bilimsel Araştrıma Yöntemleri. 15. Baskı. Ankara: Nobel Yayın Dağıtım, 292 S.
Komurkaraoglu, S. (2011). The Effect of Cooperative Learning Method on Student Achievement and Continuance Level of Knowledge in Teaching the Light and Sound Unit That is in Science and Technology Course at 6th Grade in Primary Education. Master's Thesis, Kastamonu University. Landis J.R and Koch G.G (1977). The Measurement of Observer Agreement for Categorical Data, Biometrics, 33, 159-174. Marangoz, I. (2010). The Effects of Cooperative Learning Method on the Achievement and the Attitudes of Students in Primary 6th Grades Mathematics Lesson: Geometry Learning Field. Unpublished Master's Thesis, Gazi University, Ankara. Mcmillan, J.H. and Schumacher, S. (2006). Research in Education: Evidence- Based Inquiry. Sixth Edition. Allyn And Bacon, 517 P, Boston, Ma. Morrow, K. (1994). Effects of Cooperative Learning Groups Versus Whole Class Instruction on Achievement Scores In High School Geometry Classrooms. A Thesis Submitted to The School of Graduate Studies in Partial Fulfillment of The Requirement for The Degree of Master of Science. Southern Connection State University. Nakiboglu, C. (2001). The Teaching of “ The Nature of Matter” to Chemistry Prospective Teachers by Using Cooperative Learning: Effect on Achievement of Student. Gazi University Faculty of Education Journal. 21(3): 131- 143. Ozcelik, D. A. (2010). Test Hazırlama Kılavuzu. (4. Baskı). Ankara: PegemA Yayıncılık. Ozdogan, E. (2010), The Effects of Computer Aided Cooperative Learning on Geometric Skills of Elementary Fifth Grade Students. 9. Elementary Teacher Education Symposium, Elazığ. Ozerdem, E. (2007). The Misconceptions on the Subject of Analytical Geometry and to Find Out a Solution in Licence Degree. Unpublished Master's Thesis, Dokuz Eylül University, Izmir. Ozsarı, T. (2009). The Effect of Cooperative Learning Method to the Fourth Grade Students' Achievement on Mathematic Learning: Problem Based Learning (PBL) and Student Teams- Achievement Division Method (STAD). Unpublished Master's Thesis, Ege University, Izmir. Ozyurt, D. A (2013). The Effect on Students' Academic Achievement of Cooperative Learning Model in Pratic of Science and Technology Course. Master's Thesis, Atatürk University, Erzurum. Pınar, S. (2007). Effects of Learning “Measures” Topics on Students by Education Technologies and Cooperative Learning Methods. Master's Thesis, Marmara University, Istanbul. Sarıtas, E. (2002). The Learning strategies, attitudes and performance levels of succesfull and unsuccesfull problem solvers in cooperative and traditional classes. Master's Thesis, Dokuz Eylul University, Izmir. Savas, E., Obay, M. & Duru, A. (2006). The Effect of Learning Activities on Students’ Mathematics Achievement.Journal of Qafqaz University. 17(1). Slavin, R.E. (1991). Student Team Learning: A Practical Guide to Cooperative Learning (Third Edition). Washington D.C.: National Education Assocation Publication. Tanel, R. (2006). Investigation of the effects of the cooperative learning method on understanding the second law of thermodynamics and Entropy. PhD Thesis, Dokuz Eylul University, Izmir. Tarım, K. (2003). Effectiveness of cooperative learning method on teaching mathematics and meta analytic study for cooperative learning method. Unpublished PhD Thesis, Culurova University, Adana. Timur, S. (2006). The effects of cooperative learning on student success in 7th grade primary education science course. Unpublished Master's Thesis, 18 Mart University, Canakkale. Torun, O. (2009). The effect of the cooperative learning method supported by multiple intelligence theory on the seventh grade elementary schools in their mathematics subjects of geometrical shapes on their achievement and permanance. Master's Thesis, Gazi University, Ankara. Tosun, C. and Taskesengil, Y. (2011), Development of an Achievement Test About Solutions and Their Physical Properties Based on Bloom’s Revised Taxonomy: Validity and Reliability. Kastamonu Education Journal, 19 (2), (499-522). Tsay, M. and Brady, M. (2010). A Case Study of Cooperative Learning and Communication Pedagogy: Does Working in Teams Make A Differance? Journal of the Scholarship of Teaching and Learning, 10 (2), 78–89. Ural, A. (2007). The effect of cooperative learning on mathematics academic achievement, retention, mathematics self-efficacy and attitudes toward mathematics, PhD Thesis, Gazi University, Ankara. Unlu, M. (2008).The Effect of Cooperative Learning Method on The Academic Success And Recall Levels of 8th Grade Students in 'Permutation and Probability' Subject. Master's Thesis, Gazi University, Ankara. Unlu, M. and Aydıntan, S. (2011). The Views of 8th Grade Students Related to Students Teams-Achievement Divisions Technique in Mathematics Education. Journal of Abant IzzetBaysal University Education Faculty, 11(1), 101-117. Varank, I. and Kuzucuoglu, G. (2007). The Effect of Learning Together Technique of Cooperative Learning Method on Students’ Mathematics Achievement and Cooperative Study Skills. Elementary Education Online (EEO), 6(3), 323-332. Yıldız, N. (2001). The Effect of Learning Method on Student Achievement in Mathematics Teaching of Primary School 7th Class. Master's Thesis, Balıkesir University, Balıkesir. Zenginobuz, B. (2005 The Impact of Cooperative Learning Techniques on Student Academic Performance (Geometry), Master's Thesis, Marmara University, İstanbul.